The Yellow Emperor is the legendary ancestor of the Chinese nation. 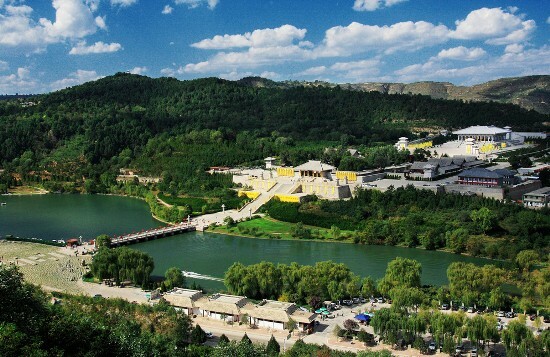 The Yellow Emperor's tomb (黄帝陵) is located on Qiaoshan Hill in north Huangling County, one km from the county seat. The Jushui River runs by the left side of beautiful Qiaoshan. Amid a luxuriant growth of ancient cypresses is the Yellow Emperor's Tomb, 3.6 meters high and 48 meters in circumference. There is a stone tablet erected in 1776 during the reign of Emperor Qianlong of the Qing Dynasty, with the characters "Ancient Yellow Emperor's Tomb on Qiaoshan." In addition there is the Temple of the Yellow Emperor at the foot of Qiaoshan, an old structure adjoining the tomb, which was used for offering sacrifices. There are three passage pavilions in the court of the front hall of the temple, with more than 70 steles erected during the Ming and Qing dynasties, and inscriptions by emperors through the ages to memorialize the Yellow Emperor. - Hours: 7:30 a.m. - 6:30 p.m.
- How to get there: take the bus near the South of Xi'an Railway Station. The costs is 20 yuan/person.